Welcome to the SPIRES trial website. 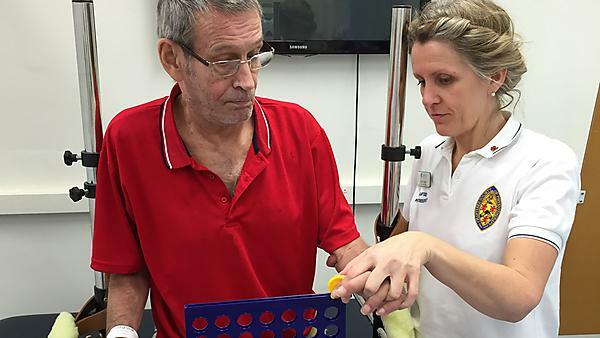 SPIRES is a multi-centre randomised controlled trial to assess the feasibility of a functional standing frame programme for people with severe stroke during their hospital-based stroke rehabilitation. This website provides a range of information about the trial, and resources both for people who have had a stroke and physiotherapists, which we hope you will find helpful. The website will develop over the course of the trial, with regular news updates to keep you informed about our progress. People with severe stroke experience significant muscle weakness which means that they spend much of their time in bed or sitting. This inactivity can cause their muscles to become even weaker and stiffer and may lead them to experience sudden drops in blood pressure when they move from lying to standing (orthostatic hypotension (OH)). This further interferes with their ability to participate in intensive stroke rehabilitation, overall recovery and quality of life. Currently physiotherapy for people with severe stroke concentrates on practising tasks such as getting in and out of bed into a chair that are important for independence and achieving safe discharge home. Standing up early after a stroke may help strengthen muscles, reduce OH and minimise or prevent muscles becoming stiff and weaker. This trial aims to assess whether it is possible for people with severe stroke to use a standing frame to practise functional movements such as standing and moving between sitting and standing during their hospital-based rehabilitation. Fifty people with a severe stroke will be recruited from four different Stroke Rehabilitation Units in Cornwall and Devon. Using a computer programme, participants will be randomly allocated to either (1) functional standing frame programme (30 minutes) and 15 minutes of usual physiotherapy, or (2) 45 minutes of usual physiotherapy only. They will have one physiotherapy session per day, with a target of a minimum of five times per week for three weeks. We will measure how many people join the trial, how many people drop out and the content of the usual physiotherapy treatment sessions. We will also assess the effect of the physiotherapy treatment by measuring participants’ ability to carry out activities of daily living, quality of life as well as muscle strength and balance. The person assessing each participant will not be aware of which treatment participants are receiving. We will assess how easy or practical it is to take these measures which will help us develop a future trial. We will be interviewing people who have taken part in the trial as well as their carer or relative and the physiotherapists involved in delivering the physiotherapy sessions. This will allow us to: identify the reasons why people decided whether or not to participate in the trial; explore their experiences of the functional standing frame programme; and understand how participants felt about being randomly allocated into different groups. To maximise impact, we will work with people with a stroke and carers to publicise the research findings in different ways. How were people with stroke and health care professionals involved in developing this research study? 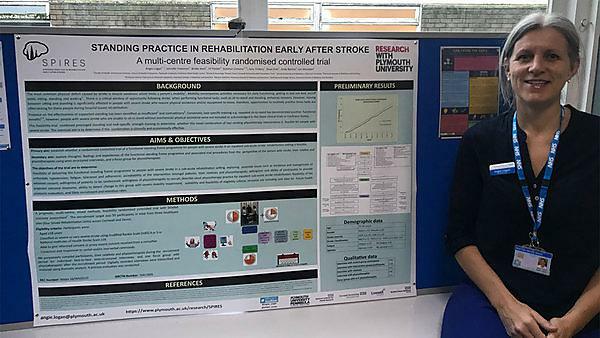 The topic was first identified as a result of discussions with patients and relatives about their priorities and goals during their stay on the Stroke Rehabilitation Unit where Angie Logan (Chief Investigator) worked as a physiotherapist in Cornwall. Once the topic was identified we worked with people with stroke and their relatives to design the trial. We undertook two patient and carer discussion groups at local Stroke Association support groups and one-to-one interviews with previous patients and their relatives across Cornwall. The research topic was strongly endorsed as meaningful and relevant by patients, relatives and clinicians. This was in line with the key priorities of patients which were to 'get up and move straight away' and to 'stand and walk as soon as possible' post-stroke. Patients believed it would 'help me get back to normal', 'allow me to do things on my own' and for those of working age 'help me get back to work'. The intervention of a functional standing frame programme specifically aims to address their stated key priorities of optimising general function, standing and walking. Several patients used the standing frame as part of their stroke rehabilitation and provided feedback on their experiences of using the frame. We undertook further one-to-one sessions with patients and their relatives and listened to their views about potential difficulties with fatigue and being physically and psychologically overwhelmed in the early stages after their stroke. They suggested that the research assessments used to measure the physical and psychological effects of the intervention should be split into two sessions for those that need it, and that standing time should be slowly built-up as they may get tired. These changes have been incorporated into the trial design. We had discussions with physiotherapists who work in Stroke Rehabilitation Units to identify the most appropriate way of measuring any changes in functional ability, strength and movement during the study. We also had discussions with people with communication difficulties (aphasia) and Speech and Language Therapists who are very experienced at working with people with aphasia. This allowed us to ensure that all the information people need during the trial is presented in a way that they may understand. All of these discussions allowed us to finalise the trial design. This three year trial has been funded by a grant from the National Institute for Health Research, Clinical Doctoral Research Fellowship Award ICA-CDRF- 2015-01-044. 21 bedded Stroke Rehabilitation Unit in Camborne Redruth Community Hospital, Redruth. 9 bedded Stroke Rehabilitation Unit in Bodmin Community Hospital, Bodmin. 15 bedded Stroke Rehabilitation Unit in Mount Gould Hospital, Plymouth. 14 bedded combined Acute and Rehabilitation Stroke Unit in Northern Devon District Hospital, Barnstaple. All sites provide specialist physiotherapy, occupational therapy and speech and language therapy. Data collection is now closed. The last participant had their last follow-up assessment on 10th October 2018. Over the next few months data from the physiotherapy sessions and the follow-up assessments will be analysed. Data from interviews and focus groups have been analysed using Thematic Analysis. As of 29/03/2018 all 3-month follow-up assessment visits are complete; we have two 6-month follow-up assessments visits and twenty-four 12-month follow-up visits left to complete. All the follow-up visits will be completed by the end of October 2018. We interviewed several participants involved in trial: four people who undertook the functional standing frame programme and six people who received usual physiotherapy. We also interviewed four relatives of participants and six physiotherapists. The content of these interviews are due to be analysed by June 2018. Recruitment closed 30th September 2017. We recruited 45 people into the trial. We are very grateful to all the participants who have joined the trial. As of 15/07/2017 we have recruited 34 people into the SPIRES trial. Our target is 50 people.